In days gone by one of the few events to break the tedium of a long close season was the publishing of the fixture lists. Argentine Apertura fixtures were released this week with eyes predictably drawn towards the numerous clásicos and Superclásico. The fun is set to commence on the 14th August although Secretary of the Players Union Sergio Marchi has called for the start to delayed. The problem is debt, specifically the debts owing to players by their clubs from unpaid wages and bonuses. Almost half of all clubs in Primera A are in debt to their players including Racing, River, Independiente, Huracán and the two Rosario teams. With problems such as these it's understandable that Argentine players move abroad to inferior leagues and teams. These transfers are as much about the security of a contract that will be honoured as they are trophies and career progression. San Lorenzo have one of the most acute debt problems in the league at present. One of the famed Big Five (the only one not to have won the Copa Libertadores) have exacerbated their own woes by spending too much money on players, paying too much in wages (when they pay them) and performing too poorly where it matters. Last season's dismal Copa Libertadores exit did little to help balance the books. Goalkeeper Agustin Orión is one such employee who's owed money together with others such as defender Cristian Tula and forward Hernán Peirone. With Orión he's the property of the club and not owned by a third party if his debts aren't settled in the next day or so he'll become a free agent. Currently with this debt San Lorenzo are unable to sell the player despite interest from Racing. Coach Simeone needs to take a roll-call before every training session at the moment, it's anyone's guess who's not turning up as a result of non-payment. AFA chief Julio Grondona has called on the State to intervene and has also proposed that the FA loan money to San Lorenzo to clear the player's debts and enable him to be sold, thus generating income. Another form of assistance could be increased revenues from the football pools, the much maligned TV deal needs modifying for a more even distribution of the cash, however the current contract runs until 2014. Surely the State has bigger concerns than propping-up poorly managed football teams? Direct State intervention in various guises aka handouts is nothing new, Racing's three successive championships between 1949 -51 were helped immensely by their ability to retain their best players - then Finance Minister Ramón Careijo was a Racing fanatic. Perhaps Nestor could have a quiet word with his wife? Those owed wages must be paid. Short-term loans maybe the answer but club presidents, boards and administrators need to be brought to justice when contracts are breached. Looking through some of the scribbled notes that I made at 2am this morning whilst watching the 2nd Leg of the Copa Libertadores Final one sentence caught my eye 'they'll [Estudiantes] do this'. Granted it's hardly the most radical prediction in the world given the scores were 0-0 at the time. I wrote it about 20 minutes into the game after Cruzeiro had expectedly seen most of the ball, the possesion though didn't really threaten Andújar's goal. Whenever the Brazilians attempted to build an attack it was efficiently dismantled by the Estudiantes midfield and they began to grow in confidence. Can Verón be held in any higher esteem by his adoring fans? Before this game it was difficult to see how - however a Man of the Match performance by the captain has secured his place in El Pincha folklore prompting his father to comment 'my son is the best player in the history of Estudiantes' Nepotism? Not at all, high praise from an integral member of the club's first golden era. In tandem with the rest of the midfield and in particular Enzo Pérez who was once again snapping at the heels of the opposition the Argentines took control of the first half. Cruzeiro took the lead early into the second half, a long range shot by Henrique took a massive deflection off Desabato to fool Andújar and 60,000 Brazilians celebrated. Unable to capitalise on the goal Estudiantes played with composure and inventiveness with Verón the the lion heart in the middle. The equaliser was instigated by Verón who with typical vision slipped a great ball to who Christian Cellay and the resulting centre was turned in by Gaston Fernandez. Mauro Boselli had misfired with a couple of first half opportunities for Estudiantes but his winning goal was a textbook downward header again from the perfect Verón centre, ensuring that he ended the tournament outright topscorer. Seventeen minutes remained in which the 4000 visiting fans won the vocal battle in the stadium. Cruzeiro hit the angle of post and crossbar in the dying minutes but their onslaught never really materialised. With Carlos Bilardo looking on approvingly in the stands Estudiantes were crowned Copa Libertadores Champions for the fourth time after a 39 year wait. Remember too this is coach Alex Sabella's first managerial role after taking over earlier this year - in Belo Horizonte his team played the perfect game, composed, patient and above all together. 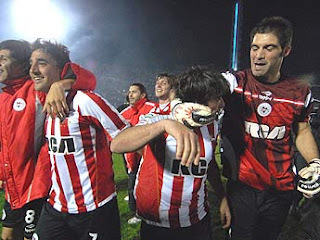 A difficult year for Argentine sides in the Copa Libertadores ends in well deserved victory for Estudiantes. No goals but plenty of intrigue to keep us European-based Copa Libertadores aficionados from drifting into a slumber. Pre-match talk was concerned as much with the Swine Flu pandemic sweeping Argentina as with the current Estudiantes team’s chances of recapturing past triumphs. Even President Lula of Brazil weighed into the debate regarding Swine Flu by seeking a personal guarantee from the Argentine Minister of Health about the welfare of the Cruzeiro party. When the smoke cleared from the pre-match barrage of pyrotechnics I half expected the Brazilians to be sporting medical style facemasks in an effort to ward off the virus although being mid-winter scarves and gloves may have been more appropriate. With Veron back in the side after injury and without the away goals rule the home side set about imposing themselves on Cruzeiro. Defender Rolando Schiavi did his best to emulate some of the more negative aspects of past Estudiantes teams by aiming a sly kick at Kleber, he’d later on receive a yellow card for his efforts. It’s true that they had most of the ball in the 1st half but clear cut chances were few and far between, any that did come their way were well dealt with by keeper Fabio including a Veron freekick. No Copa Libertadores match would be complete without a moment of farce this time courtesy of leaky water main which began to flood Cruzeiro’s goal area much to the bemusement of Fabio et al. Thankfully an adjustable spanner was found in the nick of time. Midfielder Enzo Pérez was the pick of the Estudiantes team in the first half for his work and inventiveness. The pattern of play continued well into the second half with Fabio once again preventing Mauro Boselli from becoming the tournaments outright leading scorer and also denying Desabato from the resulting corner. In contrast soon to depart Mariano Andújar in the other goal was relatively quiet until he pushed the ball in front of surprised Kleber who shot wide. The final quarter of the game belonged to Cruzeiro as they counter- attacked rapidly on a number of occasions and grew in confidence. Nil-nil at home in the UEFA Champions League can be perceived as solid result taking into account the away goals rule. However in this two leg final the rule doesn’t apply. Cruzeiro can attack more freely in the absence of this massive restraining factor. Of the eleven previous finals between Argentine and Brazilian sides in this competition only three have been won by the Brazilian teams. If Estudiantes are to prevent this from becoming four in Belo Horizonte they’ll need to draw inspiration from what has gone before. There are some matches when you simply have to be there, whatever the hurdles to be overcome. Last night's Copa Libertadores semi-final 2nd leg between Nacional (0) and Estudiantes de la Plata (1) in Montevideo was one such example. This was made all the more difficult for supporters of Estudiantes as away fans were banned from both legs after the two clubs were unable to agree on ticket allocations. It would be a game that separated the fanatics from the fans. For the Estudiantes fanatics who were present their tales will be told and re-told in the years to come and form part of Pincha folklore. It's estimated that around 300 plain clothed away fans covertly found their way into the Centanario stadium sprinkled amongst 50,000 Nacional supporters. Tickets were most likely acquired by Uruguayan contacts or Penarol fans (my enemy's enemy is my friend). With both teams sharing 6 Cups between them including 2 previous final encounters in 1969 and 1971 this was an opportunity for today's players to forge their own places in history. Once the largest stadium outside of the British Isles the Centanario was lit up with fireworks and flares prior to kick-off, only a win would see the Uruguayans through to the final. Estudiantes controlled the game for long periods and took the lead just after half time when Mauro Boselli calmly lifted the ball over the advancing 'keeper. Nacional were finally stung into action and equalised - Mariano Andújar conceding his first goal in 801 minutes of Copa Libertadores football. Boselli killed the tie in stoppage time and in doing so became joint top scorer in this years competition (http://www.youtube.com/watch?v=wEAvFyP0wgA). Far from being the classic smash and grab raid this was a composed and professional performance by Estudiantes who were without South American Player of the Year Juan Verón. For the 300 daredevils who ran the gauntlet in Montevideo one can imagine outward signs of celebration being sensibly curtailed at the final whistle in view of surroundings. Estudiantes won this competition 3 times between 1968 and 1970, that infamous team (together with Racing) ensured that any reference to Argentine football in the UK media thereafter would usually be prefixed with the word 'cynical' as a result of two bad tempered and dirty Intercontinental Cup clashes against Manchester United and Celtic respectively. Later on today the present side will discover whether they face Brazil's Cruzeiro (3) or Gremio (1), having already faced Cruzeiro in the group stages. In a cruel twist of fate it's possible that Estudiantes fans could even be prevented from seeing the home-leg of the final due to the HN1 flu virus sweeping Argentina, a decision will be made by the authorities.